Only five states earned an 'A' grade for teaching high school students about their finances. Eleven states got an 'F'. You can count on one hand-- that's right, just one hand -- the number of states that do a stellar job of producing financially literate high school students. Just five states -- Utah, Missouri, Tennessee, Virginia and Alabama -- earned an "A" in the 2017 National Report Card on State Efforts to Improve Financial Literacy in High Schools. Sadly, 12 states earned a C, four states a D, and 11 states an F, according to Center for Financial Literacy at Champlain College, publisher of the third such report card on state efforts to improve financial literacy in American high schools. The 2017 report card measures how well high schools are providing personal finance education. According to John Pelletier, director of the Center for Financial Literacy at Champlain College, states are waking up to the need for personal finance education by making modest improvements in education standards, but they still have a long way to go. Consider: A Next Gen Personal Finance study released in October showed that only 16.4% of students nationwide are required to take a personal finance course to graduate from high school. What's more, the report showed that about one in 20 students from low-income backgrounds (outside of Alabama, Missouri, Tennessee, Utah and Virginia, the five states with mandates) attend high schools with a personal finance requirement. Yes, even though studies demonstrate that financial literacy educational interventions in high school appear to have a positive impact on knowledge and measurable financial behaviors, very few states require personal finance education as a standalone course in high school. For instance, Utah, which earned an A+, and Alabama, Missouri, Tennessee and Virginia, which earned A grades, all require students to take a standalone course. According to Pelletier, some states do require personal finance education, though just not as a standalone course. For instance, 11 states require high school students to receive 15 or more hours of financial instruction before entering the workforce or going to college, according to the report card. One bright spot, according to Pelletier, is that American high schools have improved incrementally, in part because previous report cards have informed debates and energized legislation in many states, and have been used by state task forces and commissions that have advocated for increased personal finance education. For instance, Illinois, Texas, Virginia, Washington state and West Virginia have enhanced financial literacy education of high school students since the Center's 2015 report card. And Arkansas, Delaware, Nevada and Vermont are in the process of making changes that could improve their overall grade once proposed changes in their respective states take effect. Still, some states are moving backward instead of forward. For instance, Louisiana, which received a D grade, abandoned its mandatory personal finance education requirement, and Idaho, which received a B grade, reduced the number of class hours required for the subject, according to the report card. And some states are doing a terrible job of producing financially literate high school students. Alaska, California, Connecticut, Delaware, District of Columbia, Hawaii, Massachusetts, Pennsylvania, Rhode Island, South Dakota and Wisconsin received an F grade, according to the report card. And Louisiana, Montana, Vermont and Wyoming received a D grade. "Americans need to know how to use credit, save for retirement, invest wisely, and understand the many complicated financial decisions made in the average person's lifetime," Pelletier said. "It's gratifying to see that financial literacy is slowly becoming more of a priority in the states and in our nation's capital. We know that financial illiteracy was one of the causes of the Great Recession. Clearly, personal finance should be right up there with reading, writing and arithmetic as a critical subject." Financial literacy topics must be taught in a course that students are required to take as a graduation requirement. According to Ted Beck, the president and CEO of the National Endowment for Financial Education (NEFE), the Center for Financial Literacy's report as well as this FINRA report show that there are many committed states that are performing well. "But other states are not performing well and it may be due to a lack of mandate or agreed-upon strategy to offer financial education in high school," he said. Others also agree that mandates help. "I think there is 'potential' for state education systems to have an impact," said J. Michael Collins, the faculty director of the Center for Financial Security at the University of Wisconsin, Madison. "But implementation really matters." Teacher training is critical. To effectively educate our students about personal finance, we need confident, well-trained educators. For his part, Beck said, "we need better infrastructure to teach financial education in schools." This isn't just a national strategy to offer financial education to high school students, but also a plan to better prepare teachers, he said. NEFE, by way of background, published a study through the University of Wisconsin looking at K-12 teachers and found that just 29% were teaching financial education and less than 20% felt very competent to teach it. "Teacher training is critical," Beck said. Of note, NEFE as well as Champlain College have programs to help prepare educators. Funding is also needed to ensure that these classes are offered to all high school students. To make sure that the high school classroom personal finance training is working, we need to give students quality standard assessments on knowledge and behaviors. Beck concurs with the sentiment. "We need quality standards with programs -- vetted programs, relevant subject matter, and evaluation on effectiveness," he said. Collins is also of the same opinion. He noted, for instance, that some states do test content -- but most don't. Educators need easy access to quality curriculum, lesson plans, calculators, videos, games, applications, activities, projects, case studies, articles and expert volunteer speakers. A state's online education platform is ideal for providing these tools. For the record, NEFE offers a free high school financial planning program specifically focused on basic personal finance skills and the Center for Financial Literacy created this teacher resource website. How do the 'A' States Deliver? Not surprisingly, the five best performing states apply those keys to success. For instance, Tennessee and Utah both require a half-year course in personal finance as a graduation requirement, according to the report card. And Alabama and Virginia both require that personal finance instruction be given as part of a full-year course. As for Missouri, that state allows local school districts to determine whether the personal finance instruction is delivered in a stand-alone half-year course or is embedded as half of the instruction in a full-year course. Utah, meanwhile, stands out from all other states. According to the report card, that state requires that all high school students take a half-year course exclusively dedicated to personal finance topics, and students are required to take an end-of-course assessment examination created and administered by the state. The state also requires that educators teaching this course obtain a specific endorsement in general financial literacy that includes coursework on financial planning; credit and investing; and consumer, personal and family economics. Moreover, Utah also provides its educators with tools, resources and many professional development opportunities. General financial literacy is a funded mandate in Utah. By contrast, the grade F states have few requirements or none for personal finance education in high school, according to the report card. 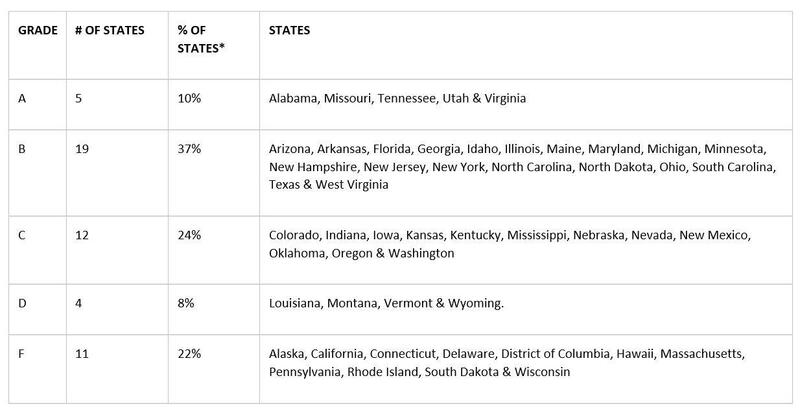 High school students in these states can graduate without ever having the opportunity to take a course that includes financial literacy instruction. Miffed by Your State's Grade? Pelletier said readers of the Center for Financial Literacy's report card in a particular state could be miffed by a C, D or F grade when their particular school offers a personal finance course. He said there are many wonderful pockets of financial literacy excellence in every state, usually due to the efforts of principals, teachers, parents and others in the community, not the result of a state-wide required educational policy. "Very often classroom initiatives vary from district to district, and even more specifically class to class on their effectiveness," said Beck. "There are many random acts of success." Lower rates of planning for retirement. Lower rates of asset accumulation. Lower participation in the stock market. But Pelletier and others have also noted that studies demonstrate that financial literacy educational interventions in high school appear to have a positive impact on knowledge and measurable financial behaviors. For instance, Collins noted that research he conducted with colleagues shows that young adults in Georgia, Idaho and Texas, which all received a grade B from the Center for Financial Literacy, pay bills on time more often than in other states. Georgia, according to Collins, mandated a graduate requirement for a personal finance course, though it took three years to phase it in. Georgia also invested in teacher training and curriculum and the state evaluated their courses. Texas and Idaho did the same in 2007-2008. "My sense from what we know from the research is experiential learning integrated into math and other courses starting around third grade is ideal," he said. "Giving kids a chance to manage money in a token economy and even take part in banking can help them learn and apply ideas." And by high school, a class might be a good idea if it is well taught, and grounded in economic principles, he said. Collins also noted that school-based education will never be enough. "Markets and products change, systems, regulations and the like," he said. "Schools can teach basic ideas and transferable skills, but as people age they have to learn how to apply basics to new issues and circumstances." And Beck stressed that financial education should start in the home. "Parents have the most influence on establishing behaviors, both positive and negative. So they should have frequent talks -- not lectures -- and use their lessons and failures as teaching tools, he said. To be fair, the fact that most states are doing a poor job of producing financial literate high school students is not new. In 2009, for instance, Annamaria Lusardi, a professor at The George Washington University School of Business; Olivia Mitchell, a professor at The Wharton School of the University of Pennsylvania; and Vilsa Curto, an assistant professor at Harvard University's T.H. Chan School of Public Health showed that financial literacy is low among the young; that fewer than one-third of young adults possess basic knowledge of interest rates, inflation, and risk diversification. And what was shown then and is still true today is that "financial literacy is strongly related to sociodemographic characteristics and family financial sophistication." Specifically, the authors, wrote in their paper, "a college-educated male whose parents had stocks and retirement savings is about 50 percentage points more likely to know about risk diversification than a female with less than a high school education whose parents were not wealthy." Background on the report card: The Champlain College Center's report card is based on research and personal interviews with state officials on their assessment policies, graduation requirements and educational standards. The 2017 report card gives grades to all 50 states and the District of Columbia You can see all states and their grades in the 2017 report card. Here are the 2013 and 2015 report cards, as well as a 2016 adult report card. And here's the Center's Prepped for Success report. What Is a Salvage Title and How Does It Impact a Vehicle? A salvage title is bad news on a vehicle, especially if you're thinking about buying it.